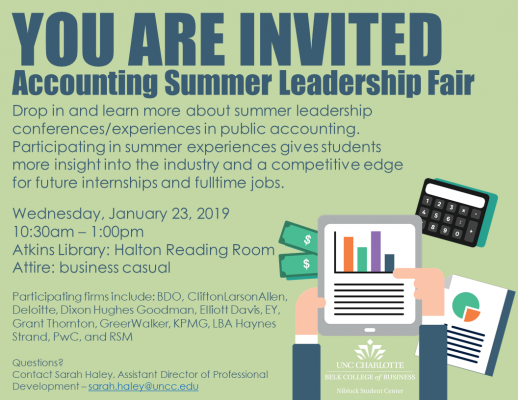 Drop in and learn more about summer leadership conferences/experiences in public accounting. These summer experiences often serve as a gateway to internships and full time jobs in the industry. Traditionally, the summer leadership experience is a 1-3 day event where students gain exposure to the firm, get some form of personal growth and development, and may even leave with an internship offer. Attend the fair next Wednesday to learn about all the firms and their summer experiences. Then, apply to the experiences you're most interested in. Participate in the interview process and be selected. Then go have a wonderful time connecting with public accounting firms at their summer leadership experiences and furthering your career! Many students do more than one summer experience. **This event is for students majoring in accounting. No RSVP is required.